SEO is a lot like fishing. SEO is about baiting a hook with different baits from guest posts to info-graphics, casting the bait into the water (the Internet), and then waiting for a bite. Preferably a lot of bites (backlinks, visitors, etc.). Not convinced that the two are similar? Isn’t the sea reminiscent of major search engines (say, for instance, Google)? One moment calm, serene, and abundant with fish and the next a roiling, churning mass of waves tossing your boat (website) to and fro. Think Penguin, Panda, and the slew of other algorithm changes that have hit like violent hurricanes. So, just sit right back and you’ll hear a tale…. Unfortunately, this is not a fisherman’s tale of the “big one”. It’s simply a cautionary tale about a bait that didn’t attract any fish. While failure is never fun or profitable it does provide an excellent opportunity to put hindsight to good use. Failure allows for reflection in a way that success doesn’t. Success tends to be blindingly bright like the beam of a lighthouse cutting across murky waters – only a thin strip (what’s in the light) is visible. Flaws, obstacles, and mistakes tend to be hidden by the success. So, without further ado, let’s dive right into the deep end and dissect this failure…. Our experiment was not an original idea. It was inspired by an article on Screaming Frog entitled Unicorn Meat and Monster Feet. 9 Exceptional Examples of Linkbait Products. The article demonstrated examples of very successful linkbait pieces such as a “Unicorn Meat”. All of the examples inspired a flurry of activity and interaction such as Facebook shares. For anyone who hasn’t heard the term before, linkbait is content (such as a fake product) that was created with the sole purpose of attracting attention and thus getting backlinks, social media interaction, and visitors. Sounds easy enough for any ecommerce site to duplicate…right? The client who was the subject of our experiment was Caster Specialists. 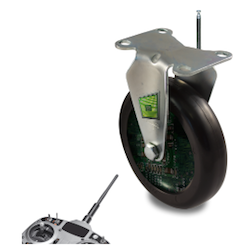 Caster Specialists is an ecommerce company that sells a variety of casters (over 100,000 types) around the world. 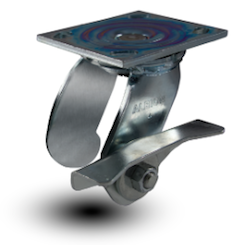 They sell casters in bulk as well as individually and market to “retail” customers as well as commercial. We’re particularly fond of this client because they are knowledgable about SEO which is always refreshing and very open to experiments. A rare combination. Our hypothesis was that creating humorous fake products and posting them on the Caster Specialists’ website would drive traffic, earn backlinks, and inspire social media interactions. Take the “build it and they will come” stance. This would have meant kicking back and waiting for links and visitors to come to us. Get proactive and try to speed up the process. We went with option 2 (was there any doubt?). Obviously, we wanted things to happen quickly (who doesn’t? ), but we also thought it was a good time of year (early to mid December) to really push these fake products. We thought that we could create gift guides centered around these fake products and pick up back links and visitors via people searching for luxury gifts or unusual gifts. It was an opportunity we didn’t want to pass up. Using the four fake products we created a total of five pieces of content. All five were themed gift guides. Three were placed on the Caster Specialists’ blog and the other two were created as slide shows (presentations) and placed on scribd.com. In order to create these pieces we had to conduct additional research to find other (approximately 40) expensive, over-the-top, and/or humorous products. In addition, more time had to be dedicated in order to develop the gift guides themselves. With the additional content in place, we jumped right into outreach. We contacted blogs and websites that we thought might have an interest in our gift guides. Keep in mind, we didn’t just email web masters and bloggers and demand a link because “we rock”. We structured all of our outreach attempts in order to show the individual why their audience might enjoy our content. For example, we referenced other gift guides on their site and talked about audience interaction such as comments, tweets, and shares. There are a couple of things that we could have done that probably would have helped this experiment experience at least slightly more success. To begin with, our process was a little jumbled. Remember back when we had to choose between option 1 (build it and they will come) and 2 (be proactive)? We should have considered that crossroads way back at the start when we were brainstorming products. Had we decided (as we did) to be proactive, we should have begun compiling an extensive list of websites and blogs to reach out to before we ever had the products created by a graphic designer. That way, if we found that there weren’t a lot of sites that were interested we could have changed our direction or scraped the experiment entirely without incurring the cost of a graphic designer and additional time. Unfortunately, we saved outreach for last and this meant that were were somewhat rushed (remember, we were trying to beat the holidays) and already committed to our themed fake products. In addition, had we compiled the outreach targets in advance, we could have begun by engaging them on social media platforms such as Twitter in order to build some type of relationship before asking for a link. That’s always the better route to go. Our next mistake was setting a deadline that was too tight. This deadline was imposed by us – not the client. Designing products, creating quality content, doing outreach, and gaining attention take time. Giving ourselves less than a month wasn’t wise. Yes, Christmas probably was a good opportunity; however, we should have let it pass us by because meeting that deadline was quite simply impossible. The final mistake we made was one we should have foreseen but not one our actions could have changed. If you will refer back to the Screaming Frog article, you’ll see that the majority of the examples are sites that tend to attract audiences that engage in social media. Let’s face it, not a lot of people are tweeting about casters. The individuals that naturally come to the Caster Specialists’ website aren’t likely to pin or share or tweet or +1 content; they’re trying to order custom casters for their fleet of office chairs. This means that we’re likely to see little or no attention via the “build it and they will come” approach. While we made critical mistakes, there were several things that we did right. For one, we tried something new. Look, SEO is always changing. New techniques are always coming into vogue. We were brave and tried something new (at least to us). You have to do that if you want to gain the upper-hand in SEO. In addition, we hired a professional to compensate for our shortcomings. We aren’t graphic designers or Photoshop experts. We accepted that fact and footed the bill to get things done right. No one wants to link back to poorly designed images or content that isn’t well thought out. We dedicated a good chunk of time to planning out the content for this experiment. From product descriptions to outreach emails we chose our words carefully. With linkbait that thought, that ability to produce strong content, is still necessary. Don’t be afraid to try new tactics. Know your strengths and weaknesses and get help to compensate for your weaknesses. Don’t put the cart ahead of the horse. Find your outreach targets at the beginning of the process. Be realistic about your timeline. Be willing to put in the effort. Linkbait is not a “get rich quick” scheme for SEO pros. There are a lot of great resources out there for SEO professionals, from the newbie to the seasoned veteran, to utilize in order to learn about SEO tactics. 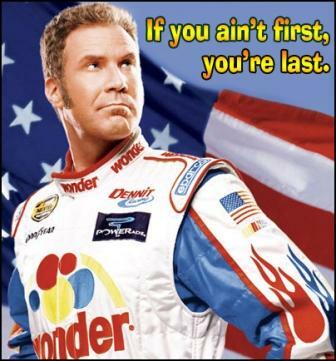 However, a lot of times all of the articles center around success stories. There are a lot of variables that go into an SEO project let alone the overall client campaign, and believe it or not, failure in the SEO world is common. It simply isn’t talked about. Why? Is there a belief that any tactic that doesn’t produce stellar results isn’t worth talking about? Failure is an opportunity for you and others to learn. It shouldn’t be swept under the rug. So, let’s talk about it – share a SEO mistake that you have made or a failure that you’ve experienced. What did you learn? Great read! If you guys released these around christmas time just wondering if any of the products had a “Christmas” theme to them? 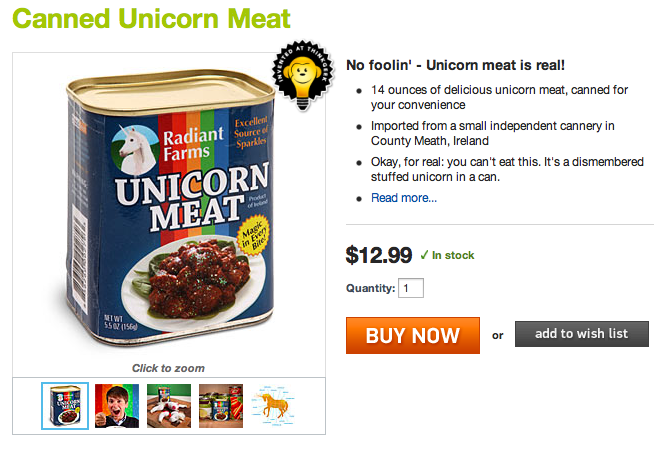 I thought the unicorn meat was hilarious but it was not really themed to the holiday. Anyhow, was just wondering as I read this. Hey AJ – no, none of our products were holiday themed. However, we took the products and made “gift guides” which we were pushing for the holidays. For instance, one was called “Santa’s Swag Bag” and it was all high end, luxury gifts. Failure won’t be rampantly talked about in this industry because it requires you to wear your heart on your sleeve and admit you did something wrong – which has monetary impacts as well as an impact on the perception of your business as capable to do the work. So, people will keep on failing in private. Which is too bad, because there’s a lot to learn through failures (both your own and those of others). Cheers on your bravery in posting this. Joel – Thanks for reading and your thoughts on why failure isn’t discussed more. I agree that a lot of individuals fear that saying “hey we totally flopped” will impact how they are perceived in the SEO industry by their peers (not necessarily clients). However, I’d be willing to bet mistakes (if not out and out failure) are really common in our industry. After all, we aren’t playing by hard rules here. Everything is so flexible and what works for one client won’t work for another (as indicated by this article). Maybe instead of calling it failure I should have just said “share something that you tried that didn’t work”. That’s a little less like blaming someone. Thanks Joel. I’ve always been very appreciative of reading about people who seem “soo smart and successful” when they discuss their failures. It brings us back to reality and shows us that we’re all human and learn as we go. Even the people who “have it all figured out”, don’t. Hopefully someone will be able to get some ideas or inspiration from what we tried. I know it has helped us to do a post-mortem and see what we can improve! Enjoyed the read. I think it could quite easily have been a post about a successful link building campaign because I actually love the ideas and creativity which went into this. Gaz – I’m glad you enjoyed reading the article. All of the elements of this project are still in place (ex. product pages); however, as of right now we haven’t talked about trying to actively relaunch them (new outreach and all of that). I think after we realized what a failure it was we kind of wanted to move on to other (more successful) tactics ASAP, and in general, put some distance between ourselves and this failure. However, with this article we’ve truly faced the mistakes we made and maybe something could be salvaged (beyond this article) from the project – after all, like you said, a lot of creativity went into it. Yeah, I can see that and it’s fair enough but I’d love to see this turned around. The most confusing this for me about what you did was launching at Christmas, I mean, people are actively looking for this sort of content around this time because of April fools day. Thanks for sharing this, found it very interesting as you don’t see people discussing their mistakes. I guess if you can take something positive from it then that’s a good thing (and if the client was willing to try then I don’t think you failed them). Paul – Good point. The examples in the Screaming Frog article that inspired us were definitely humorous. 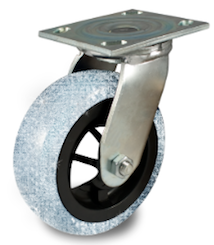 We really wanted the fake product to be casters and (try as we might) we struggled to make casters laugh out loud funny. Part of that was the time line we imposed on ourselves (really not a good idea!). Now, 3 months later, I’ve thought of ideas that if not quite laugh out loud funny are at least more humorous than what we came up with. Hindsight is always 20/20 right? Anyway, since we couldn’t come up with anything super funny we went for shock value. We wanted people to look at our products and be like “no way would I pay that much for a caster”. In our gift guides we used all REAL products that are ridiculously high priced – I mean, would you pay $100,000 for a razor or almost $13,000 for a monopoly set? Loved the transparency here, I too like to talk about our link building failures sometimes. I think we learn more from failures and rough patches than anything, so I am super glad to see we have another ally in sharing both sides of the link building coin. I will say this is part of the reason why I try hard to dissuade my team from linkbait, and more towards assets. I’ll be sharing the details soon about a failed link building effort we revived, but basically because it was a useful asset we monitored the heck out of the industry and when they and the news started talking about a new innovation in this space, we’d update our infographic with the new info and try to get it into the news cycle. The first launch failed miserably, but when this new news item came out, we timed it right, updated the asset and booooooooom! 35 links (highest was a da 70+) the first launch got 4, we are now not putting the pressure on ourselves to come up with new ideas, but instead keep this thing up to date and keep pushing it when there is an innovation or change in industry data. Just my .02, thanks for sharing! Wil – Thanks for reading! We’ve definitely experienced more success with assets. While I’ll always be up for experimenting with SEO tactics and trying new methods, assets (versus attention getting ploys with little substance behind them) are definitely a better bet. I’m interested to read your article about the failed link building effort you revived! Yeah Wil that’s the thing with link bait, especially this one in particular, is that we’ve boxed ourselves in here. It’s much harder to repurpose after the event (ie. Christmas) and so we somewhat missed the boat on that opportunity. We’re also pushing more towards building longer term assets that can provide value all year long. Great to hear about you turning a piece of content around based on current events. I’d love to read about your failed link bait experience as well! Everyone and their mom says that you can get links just by putting out awesome (or in your case, interesting) content. The fact remains: linkbait is a number’s game. You may have to try 5 or more campaigns before getting a single link. And even then it takes A LOT of personalized outreach. Backlinko – Personalized outreach definitely helps. Especially if you have the time/resources to build a relationship beforehand (comment on their blog, tweet at the, etc.). Thanks man, and you’re right “just put out great stuff and links come flooding in!” That’s not the real world. It works for big brands who are already established, but doesn’t work when you’re trying to get a site off the ground. Alex, I’ll echo Wil, thanks for the transparency. We can all learn from failure, perhaps even more so than success at times. Here’s hoping your post about a linkbuilding failure will turn in to good links for you. Bill – Thanks for reading! Hopefully it’ll at least save someone else a bunch of time! Pingback: The Best Expert Advice On Content Marketing This Week April 3rd, 2013 | Ghergich & Co.
Hi thanks for the story. Light industry is never easy, but you may not have recognized a reason that’s hiding in your final observation. Directly connected to the fact that people who buy casters don’t engage in social media (or link), is the fact that your link bait didn’t connect readers to the casters. Missing was a connection between caster and everyday life… even specifics of some every day life instances. Without that, it’s only remarkable to people already looking at casters.. which as you noted, is a very small pool. A “make your own skateboard from casters” extends your reach into somebody’s life (skateboarding). And this highlights the other essential point — you had very limited real estate (ecommerce shopping page) to work with, which is a real problem for all ecommerce linkbuilding. And that’s why some of the most successful ecommerce sites integrate lifestyle content directly into the product showcase pages! Your SEO team shows great promise…keep going! Hey John, thanks for sharing your insight! We are always striving to grow and improve and this was a good learning experience for us. You’ve certainly provided some really great ideas and ways we can think differently about how to put a spin on our content. I really appreciate your feedback, thanks John! I thought this was brilliant in that you had the courage to admit to failure, publicly. Equally important in making this article excellent was you going through your mistakes and showing what you learned – I found that eye-opening, especially as someone who’s done similar things. Also, I hope this makes prospective clients more inclined to work with you – you’re now more savvy and more likely to get the next attempt right! The thing I’ve found with our industry is that: there are no secrets. SEO isn’t a secret. What you’ve worked on isn’t a secret. It’s all there, so let’s just come out with it right away and start building trust. 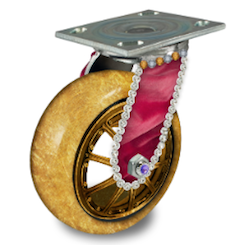 One other thing – I personally didn’t think the diamond or gold wheels really looked like they had diamonds or gold. One looked like white-ish plastic and the other like wood with some bronze plating on the wheels.